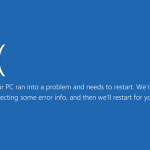 In this article we are going to show you how to fix an issue, when your PC ran into a problem and needs to restart. This error does not let you log into the system, so we need to fix it. You should notice that this error message will pop up only for a few seconds and then suddenly the system will restart again. 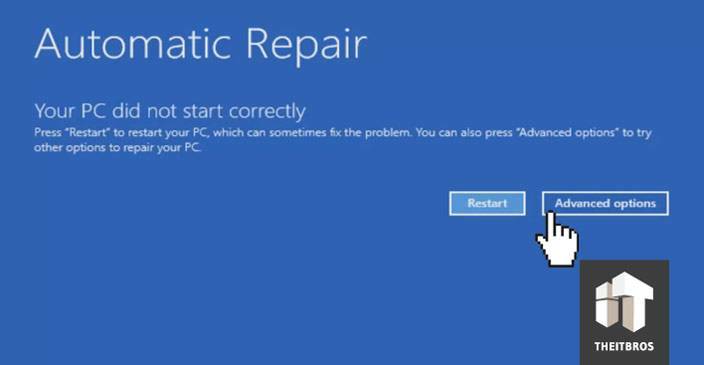 After restart you will see that your PC is preparing for automatic repair and after some time it is start diagnosing your PC. Finally you will receive the screen showing that Your PC did not start correctly. Here we have two options: Restart and Advanced options. Before we are going to Advanced options for resolving this issue, let us tell you why this situation happens. There are multiple reasons, which include changes in registry, recent changes in Hardware of the system, any recent driver installation which went wrong or improper shutdown of the system which includes forceful shutdown. Let’s get back to the Automatic Repair screen. From here, if you restart the system, it comes with the same error. So, click on Advanced options. Here you have 3 options: Continue, Troubleshoot or Turn of your PC. If you click on Continue, it will not do anything and you will end up with restarting again. What we need to do is just click on the Troubleshoot option. Now, go to Advanced options and then you will see multiple options. The first one is System restore. This option will help you if you have created a restore point. We haven’t created any restore points, so this option is not going to help us. There is a couple of other options, but we have to go to Command Prompt. So, click on it and it will open up cmd.exe as administrator. Now, we are going to restore the registry. We have seen the reasons for this issue and one of the reasons is a change in registry. So, let’s restore the register to its original state. Go to C drive by writing C: . After that we have to go to CD Windows\System32. After that type in CD config. Now we want to see the files here. Type in DIR and click Enter. As you can see there is a folder RegBack, go into that folder with CD Regback. 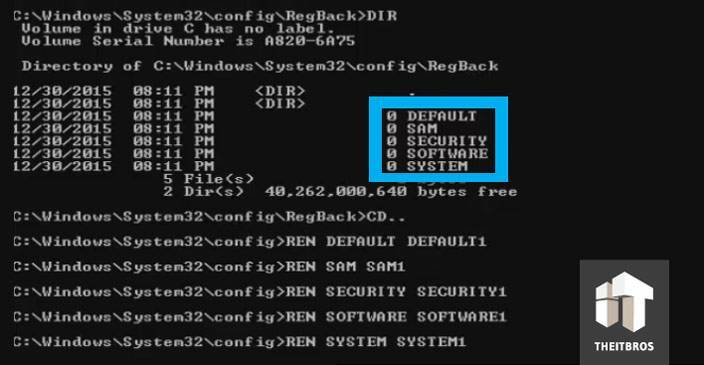 As you can see, there are 5 files (DEFAULT, SAM, SECURITY, SOFTWARE and SYSTEM). These are the registry backups. Now, go back to the config folder by writing CD.. . After that, type in DIR to see the files in that folder. As you can see now, there are 5 files with the same names. But there is a difference. 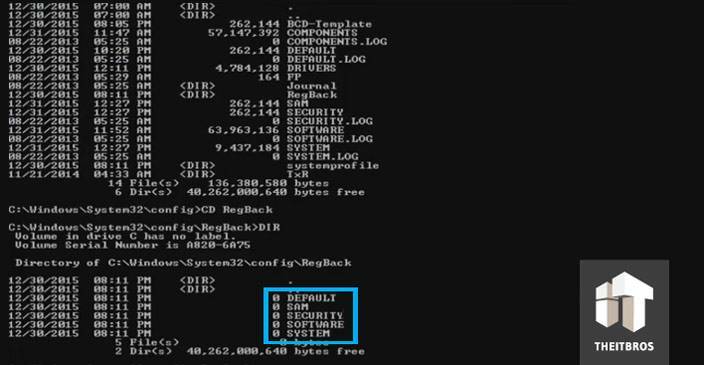 The files in RegBack folder is for backup, and the files in the config folder are using now. So, we just need to replace files in the config folder with files from the RegBack folder. But we don’t want to delete files from the config folder, because it’s safer to just rename them. Let’s do it. You can rename DEFAULT file by writing REN DEFAULT DEFAULT1. It will rename DEFAULT file into DEFAULT1. Do the same thing with the other 4 files. So, once all these files have been renaming, we are going to copy these 5 files from the RegBack folder to the config folder. Type in CD RegBack to go to the RegBack folder. 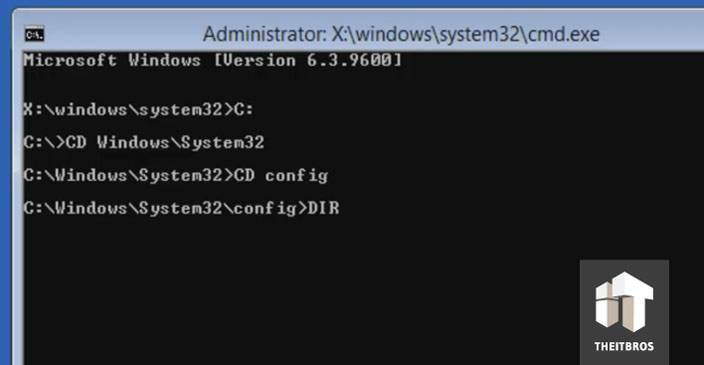 Now we have to copy all files to the config folder, so just type in COPY * C:\Windows\System32\config. Now go to the previous directory and type in DIR. As you can see, we did it properly, so type in EXIT. 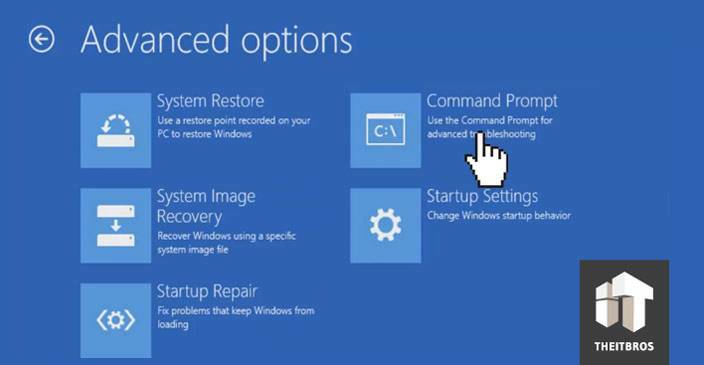 Now click on Turn of your PC and after reboot you will see that your system starts normally. That’s all.